Oh Portland…how I love you. With your ocean waters, golden summer sun, and crowds of admiring tourists brought here by air, land, and sea. Your winters are a little on the rough side and seem to last forever, but fortunately, you’ve got plenty of food to keep us entertained and add that layer of warmth to our bodies when the sun isn’t doing it for us. Of course, that food is what we’re here to celebrate. It’s been a busy year for Portland – with many restaurant openings and closings, as usual – but it’s also been a busy year for me going to many newcomers on the scene, and also revisiting some favorites to keep up with what they were doing too. Part of that included significant time blogging for the Bangor Daily News, and of course, recently returning full-time to this, my own personal blog. This year, I’ve had the opportunity to try more food, eat more special dinners, and meet more people in the restaurant world than I ever have and I’ve been lucky to do it in the greatest food city imaginable. When you’re involved with food in Portland, it’s truly special. So, thanks to all the restaurant owners, chefs and other employees, food media, PR, and everyone who makes Portland eating so great for me all the others who are here looking for a spectacular food and drink experience. In this article, I’m recognizing the best restaurants I visited from either blog I wrote for, whether or not I’ve reviewed them before. There may be repeat winners as they deserve to be celebrated too. The criteria are overall quality of experience with a focus on food, atmosphere, and service with strong consideration given to value and how well they stand out in their genre. Congrats to everyone and thanks for making 2017 my most delicious year yet. It should be noted that a lot of the restaurants below are new as of 2017. There are some true standouts that opened over the course of the year and they have earned some good words and recognition. Opening a restaurant is no easy task, especially where there are already many great ones, but it’s even more difficult to make a lasting impression on customers and that’s what many of these have done. Here we go. Restaurant of the Year – Izakaya Minato, 54 Washington Ave.
Having eaten at so many restaurants this year, some really excellent ones regrettably didn’t make this article at all and many of the ones mentioned below could certainly take this spot. In other words, choosing my favorite restaurant of the year was no simple task. However, taking into account all the criteria above, Izakaya Minato deserves this accolade and then some. Highlighted by Garlic Edamame, Kimchi Fried Rice, and Japanese Fried Chicken – which my wife deemed a food “you have to eat before you die”, my meal was an absolute barnburner. One after the other, I tried foods that either made me reconsider my thoughts on flavor combinations or simply knocked me upside the head with beautifully concocted, elegant tastes. When I walked in, I was excited to go to a Japanese restaurant where sushi wasn’t the main focus. On my way out, I was left wanting to go back as soon as possible. Izakaya Minato makes food that is stunning, interesting, and exciting. That, and they hit all the marks for service, atmosphere, and – at $40 for my wife and I combined – are on the list of best values around. 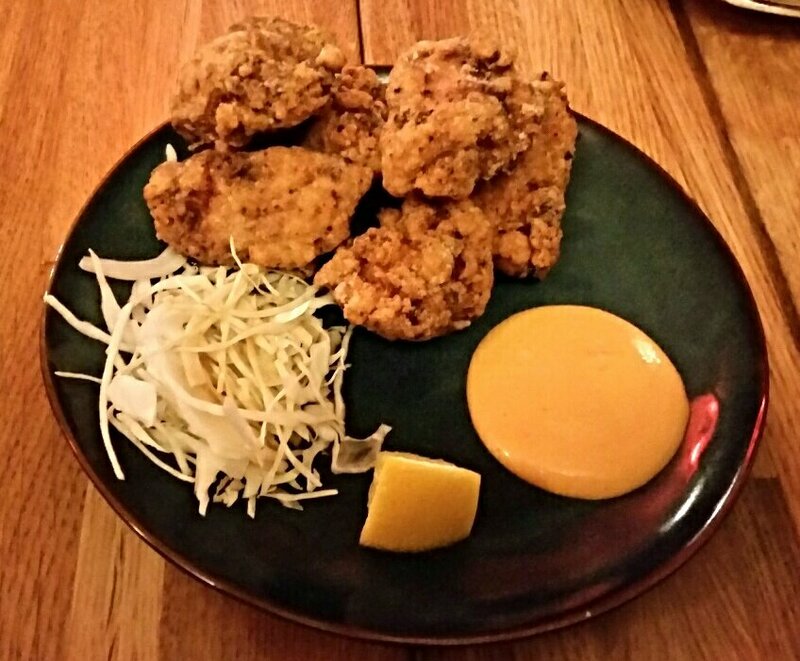 If you want a meal that will knock your socks off, impress friends, or make you feel special, Izakaya Minato is the place to go. It’s difficult to go wrong there. 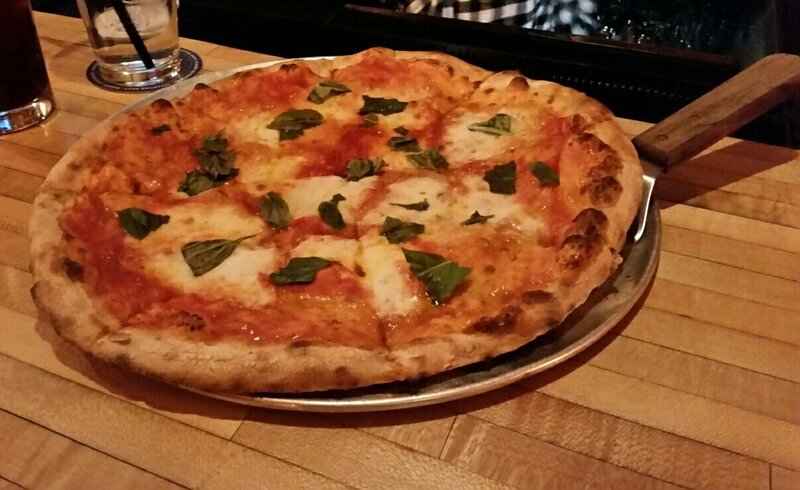 Their JFC is among the best foods in all of Portland, so that alone is worth the visit. But you’d honestly be missing out if you didn’t have a more thourough sampling of their menu. It’s just that damn good. Honorable Mention – Street and Co., 33 Wharf St.
Street and Co. does non-fried seafood just about as good as anyone anywhere. 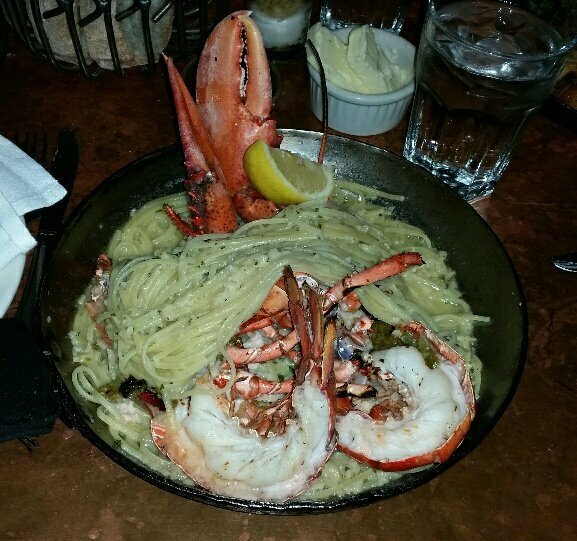 My Grilled Lobster on Linguine was a masterpiece of the senses. It looked beautiful, smelled of mountains of garlic, and was everything something that sounds that good should be. There was also lots of it on my plate, so there was no chance of me going home hungry. Plus, the scallop meals in front of my tablemates were just as good. 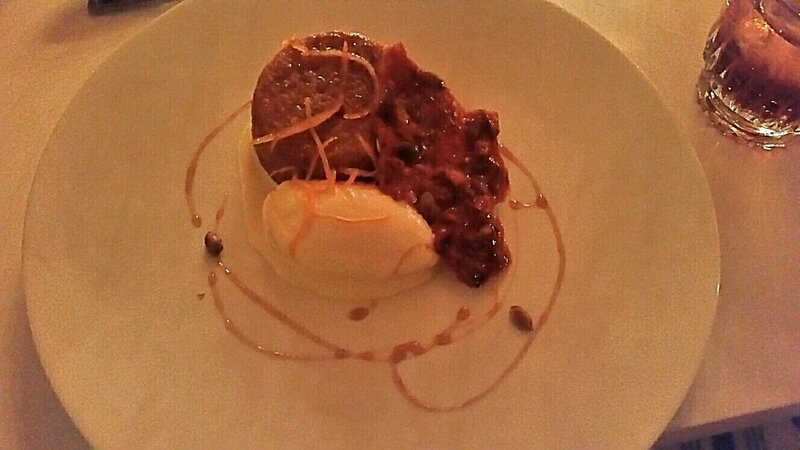 It’s pretty clear why Street and Co. is a perennial favorite in town. Their food is excellent and they’re getting their wares from nearby, enabling them to serve some of the freshest, tastiest sea creatures imaginable. Whether you’re a local or a tourist, there isn’t any good reason not to go there on occasion and treat yourself to an incredible meal you’ll remember for a long time to come. 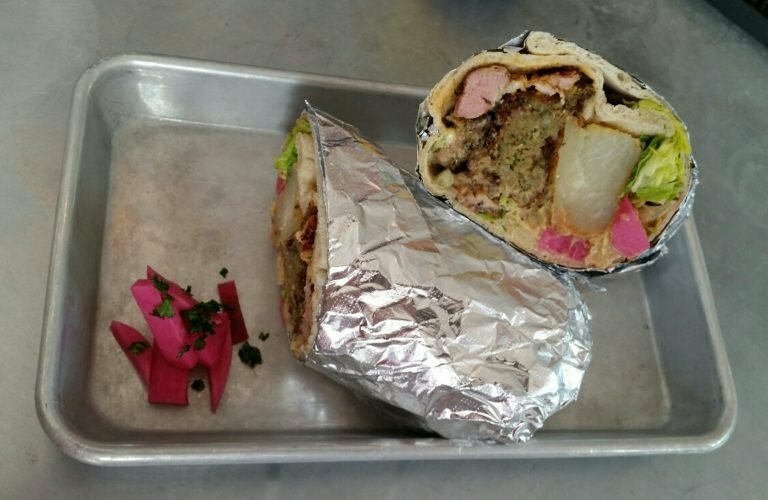 Best Ethnic Food – Baharat, 91 Anderson St.
Middle Eastern restaurant Baharat made a name for themselves when they were only a food truck (under a different name), but their more accessible brick and mortar store has been exactly what I hoped it would be and then some. From their mezze/apps, to Kebabs of chicken and lamb, and the massive Shawarmageddon – an “everything” sandwich, the food is sometimes simple and occassionally more complex, but always delicious. In case the food isn’t enough, they are another in a line of new restaurants around Portland that are taking cocktails to another level. What’s even more exciting is that many of these places – like Baharat – aren’t the types of venues in which you might expect that. I recommend a few different libations, but you’re guaranteed to love A Rad Mirage which is made with Lebanese yogurt, honey, and mint. I assure you, like some others there, it’s a drink you’ll want to go back for again and again. Honorable Mention – Lazzari, 618 Congress St.
It’s probably safe to say that pizza has transcended ethnicity to a large extent, but one of the things that makes Lazzari so great is that they make a serious – and incredibly sucessful – attempt to keep the Italian food theme throughout the rest of their menu. From the incredible Panzanella I had in July to the Italian street food known as Suppli, they throw a wrench into the traditional pizzaria and take it to a different, well-thought-out place. 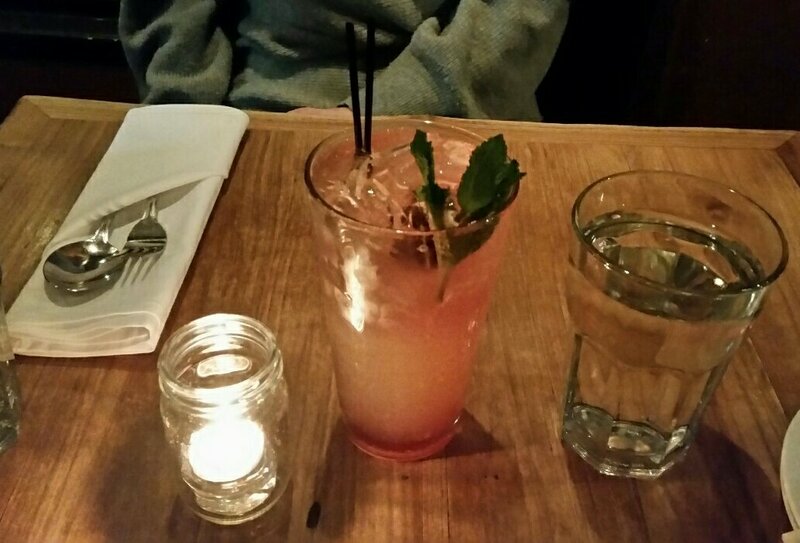 I can’t stop talking about Lazzari before I mention their drinks too. They have some of the best drinks in town and if you haven’t sampled them, it’s probably time to do that. I haven’t had a cocktail there yet that I didn’t find absolutely stunning. They’re original, preposterously delicious, and the perfect compliment to the simple, yet exquisite pizza. Best New Restaurant – Little Giant, 211 Danforth St.
Little Giant certainly got my attention this year. The beautiful eatery, opened as Andrew and Briana Volk’s follow-up to their very popular Portland Hunt and Alpine Club, is a change of pace in that it focuses on full service meals, rather than only drinks and snack. 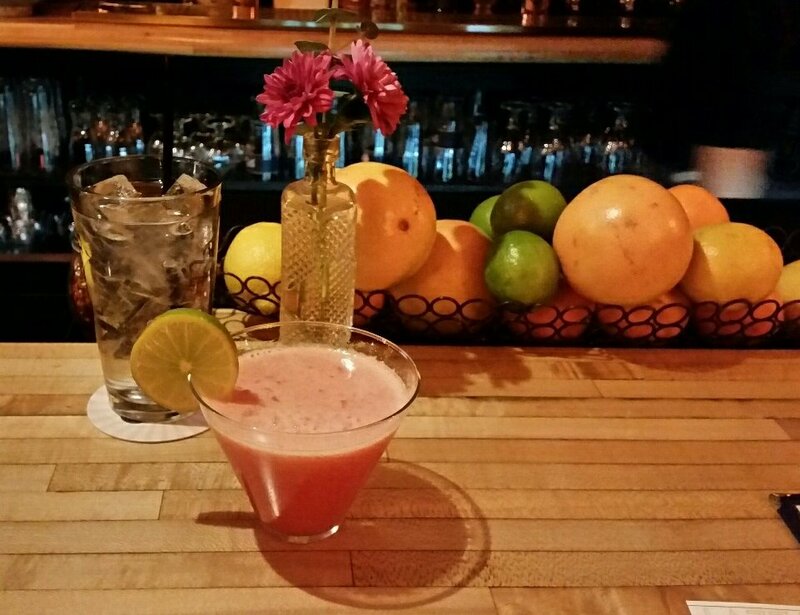 While LG has their own thing going on, they continue on a Volk tradition of artfully created foods and drink with bold flavors served in a relaxing atmosphere. As my most reviewed restaurant this year, I can say that multiple visits in a short period of time are not only okay, but encouraged. Graze on the amazing cheese ball, biscuits, and a small oyster taco while drinking creations with names like Knife Fight and Born To Run. Then move on to the house burger, skirt steak, or a very potent mushroom pasta. Whatever you eat or drink, you simply can’t go wrong. Honorable Mention – Blyth & Burrows, 26 Exchange St. 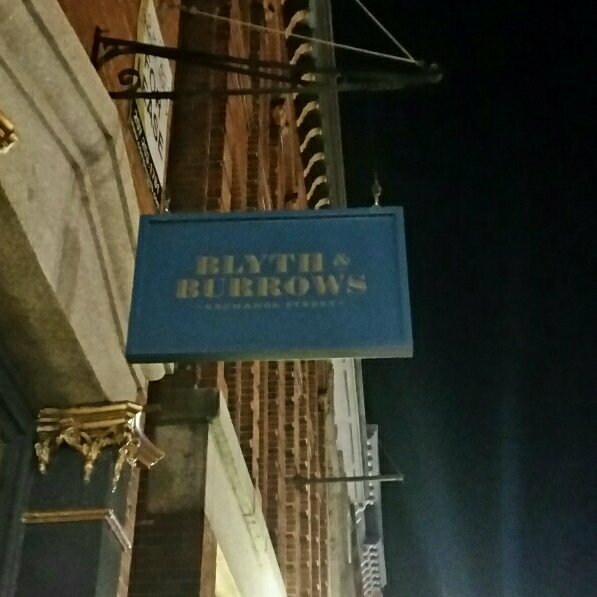 There aren’t many places with a theme and atmosphere as cool as Blythe & Burrows, but add to that to the secret door leading to a totally different bar downstairs and you’ve got the makings of a place that can potentially amuse patrons for hours. They only serve small plates, so don’t go looking for an entree, but you can be sure that the food and drinks deliver and ordering enough plates to fill you up and call it dinner seems totally appropriate. My first post-opening day visit just recently made me a total believer in what they’re doing. All the food was high-quality and the drinks hit the mark too. My wife thought the Poke Bao was one of the best things she’d eaten all year and my Korean Short Rib Bao also was very pleasing. If you’re an oyster lover, they’ve got a great selection of those too, including a charbroiled option if you like those babies cooked. Best Upscale Restaurant – Emilitsa, 547 Congress St.
What can be said about Emilitsa that hasn’t already been said by Portland as a whole? If you want upscale food and drink, it’s hard to find a better place to go. From the first bite to the last, and every single one in between, they serve Greek cuisine that is absolutely magical. They also put an exclamation point on customer service and have every last detail down to a science. I particularly appreciate the offer to take jackets immediately upon being led to your table. 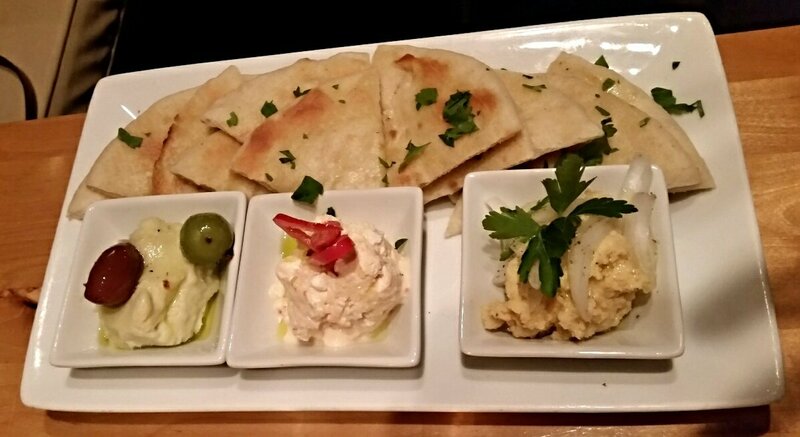 Like many restaurants in Portland, Emilitsa’s menu changes frequently based on the season and to keep it interesting, but regardless of what else they’ve got available, I highly recommend the spreads to start. Frankly, anything you order after that is all but guaranteed to be an absolute winner. I think if you go, you’ll wholeheartedly agree. Honorable Mention – Bolster, Snow, and Co., 747 Congress St.
Bolster Snow invited me to check them out shortly after they opened and I feel lucky they did. With only about a month under their belt, they came through in a big way. Starting with a top notch drink – Honey Buck – and moving on to apps and snacks, our meal got off to a really great start and continued right through the completion of our entree. It was unfortunate that we didn’t have room left for dessert, because an “eclair” with cranberry was right up my alley. The restaurant serves weekend brunch and is open for dinner Wed-Sun in the winter. They receive a fair amount of nightly traffic for drinks and rightly so, because their libations are proper and the lounge areas very inviting. 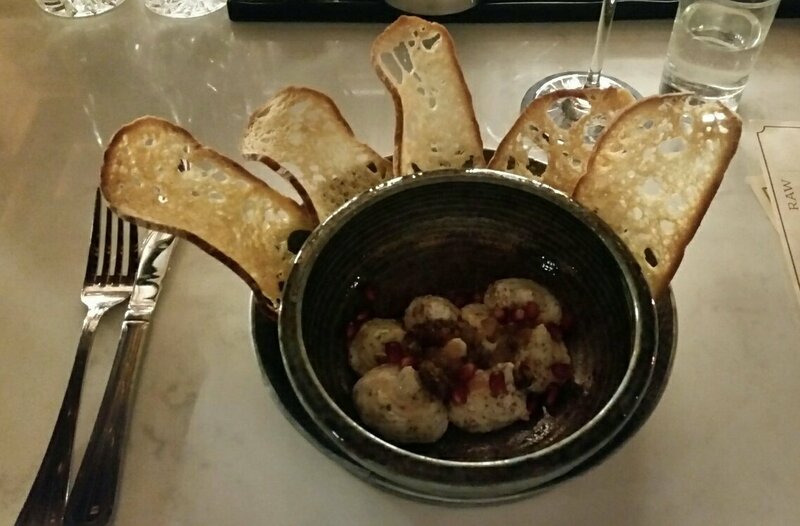 However, their food makes staying for a full meal after a cocktail or two a very reasonable proposition. They’re just getting started, but I think Bolster Snow is going to be making Portlanders happy for a long time to come. Best Eats on the Cheap – Cong Tu Bot, 57 Washington Ave. Despite what many are saying about the Portland food scene, there are still a number of eateries that are both tasty and inexpensive. Vietnamese eatery Cong Tu Bot is one of those. With their small menu of often spicy food and their “throw a restaurant into an empty garage” appearance, they have created a little eatery that reminds me of the big city. It’s sparsely appointed restaurants like that – the interior is nice enough, though plain – that I often associate with having top notch food. Portland is small and filled with foodies always looking for the next big thing, so it’s not likely Cong Tu Bot will be the place only you know about and get to introduce to everyone for the first time. That’s good though, because they deserve to be more than that. My only warning is to take them seriously when they say their food is spicy, because unlike many others in this area, they actually mean it. Big Fin Poke isn’t the type of place I normally review. The counter service and create-your-own style food doesn’t always offer quite the excitement of table service with the chef’s best creations. 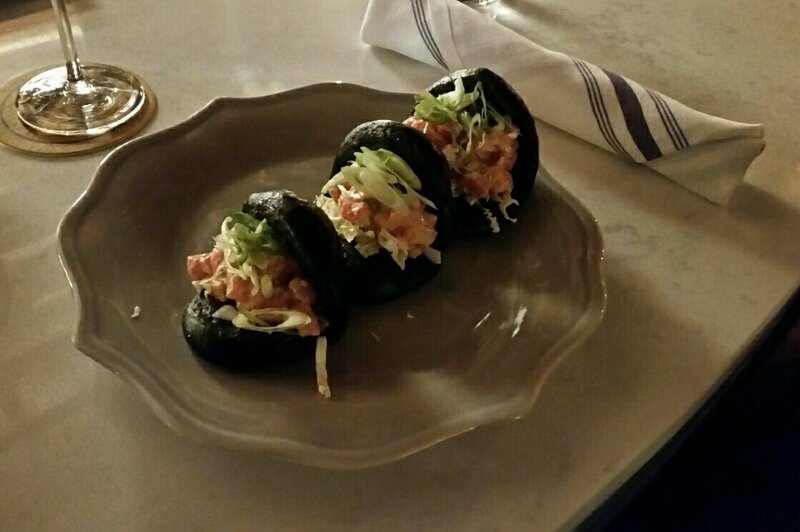 However, they introduced Maine to poke – Hawaiian style sushi – this year, and in doing so, have made a name for themselves, because not only is it inexpensive and really good, it turns out it’s quite fun to order. Whether you decide on one of the house creations or start yours from scratch, you can be sure that Big Fin has sometthing to satisfy whatever your tastes are at the moment. 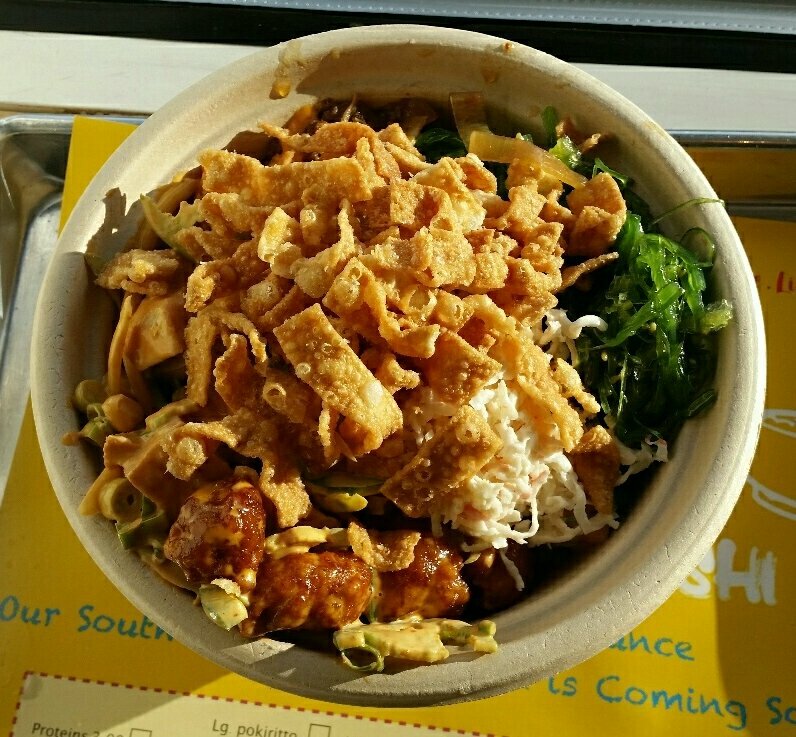 Start with a rice bowl, a wrap, or a salad and then add raw fish, cooked beef and chicken, and even tofu. Then pile on any number of interesting additions. It’s even better than it sounds and if their new, second location in SoPo is any indication, a lot of locals agree. What makes 33 Elmwood in Westbrook so fun is that they have games, but what a first-time visitor might not expect is that they also have solid food and drinks. When I went with a group nearly a year ago now and shortly after they opened, their bowling alleys weren’t ready, but the rest of the place was in full swing. We had a meal and then played some bocce. But the very good reason why 33 Elmwood makes this list is because of their Fried Deviled Eggs. Made with sriracha, dijon, and chive, the chicken seed was crunchy, tangy, and delicious. As someone who loves deviled eggs in pretty much any form, this preparation took a favorite of mine culinary delight to a whole new level. And I’d be remiss if I didn’t mention that they have lots of other great food too. 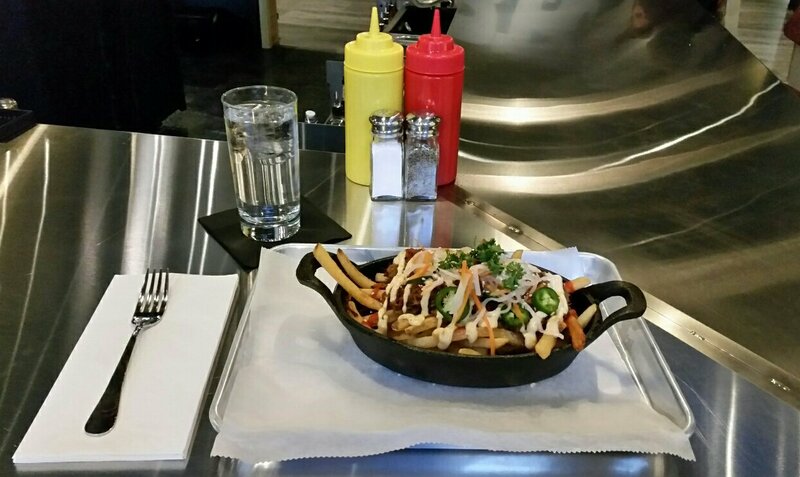 Honorable Mention – Liquid Riot, 250 Commercial St.
Have you ever had the Duck “Nachos” at Liquid Riot? Well, neither had I until I finally got there this year and I can’t believe what I was missing. Made from what might seem like a strange combination of ingredients – house potato chips, duck confit, apple butter, blue cheese fondue – the dish was amazing with lots of brilliant flavors wrapped into one insanely delicious package. 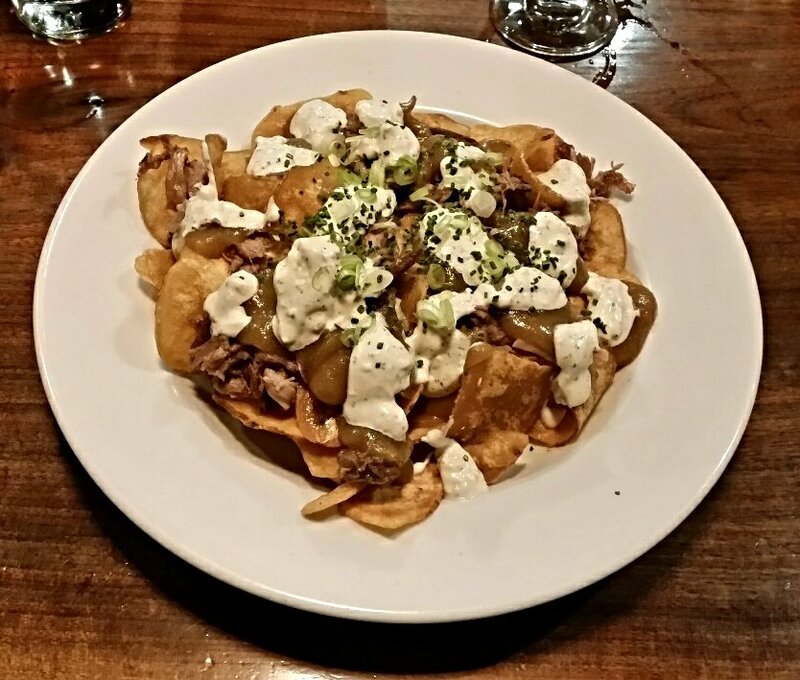 Like all the eateries on this list, Liquid Riot offers lots of good options for tasty sustenance, but the duck nachos are an absolute “must have”. I suppose any item with the word “nacho” in it is worth a shot, however these are a little out of the box which makes them special and more than worthy of a try. Of course, the specialty there is the booze made in house, and that all just so happens to go perfectly with nachos of any kind. Best Place to Grab a Drink/Beer/Wine and Chill Out – Mash Tun, 29 Wharf St.
Mash Tun is quickly becoming one of my very favorite spots in Portland and with good reason. They take no frills greatness to a whole new level. With an excellent beer list and a tiny menu on which everything is both really basic and utterly awesome, Mash Tun makes not only a good place to hang out and drink beer on a whim, but also a pretty excellent location to sooth that growling stomach. If their beer and food doesn’t convince you to visit, their prices are a drop in the bucket too, so you’ll leave feeling like you made a good decision for your family’s long term financial heath. I can’t get enough of Mash Tun and I feel like they might be the perfect place to take up residence every year during the cold weather until they save me enough money to buy an actual winter home in the tropics. 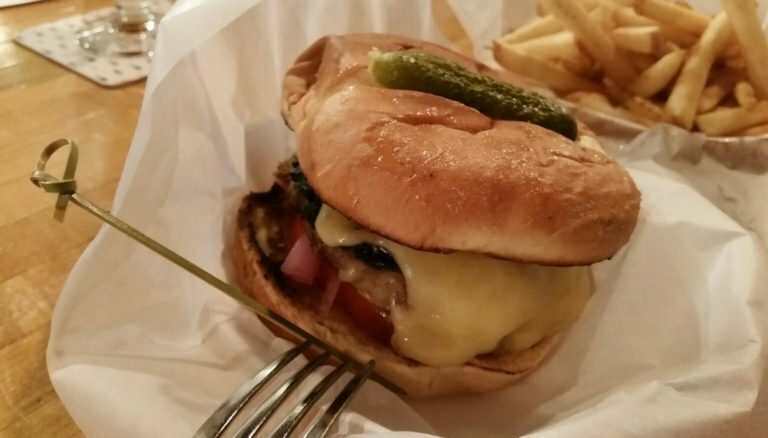 Honorable Mention – BRGR Bar, 11 Brown St. I went to BRGR Bar alone the first week they were opened while my wife was traveling. I ate plenty, but I couldn’t get rid of the feeling that it would also be a great place to just sit for a while and enjoy some suds. Sure, the fact that burger is in the name of the joint will likely drive you to order some sort of food, but there seemed to be plenty of people who were content just having a beer or adult milkshake while I was there. I’ve suggested to a fair number of friends that they go and if I’m taking their word for it, BRGR Bar is impressing everyone who walks in the door. For those who don’t love beef, fear not because there are lots of different options including poultry, fish, and both vegetarian and vegan options. Plus, with fries, tots, apps, and salads, you’ve got a wide range of non-burger choices. I recommend trying the Vietnamese fries, but where you go from there is anybody’s guess. There are best of the best restaurants I visited in Portland in 2017. I wish I could have recognized more, since the margin of victory in almost every category was nearly negligible this year. Regardless, Portland restaurants continue to be the best in the game. Look forward to lots more food talk this coming year and maybe some new and exciting things from me too. I think 2018 is going to be incredible. See you then! 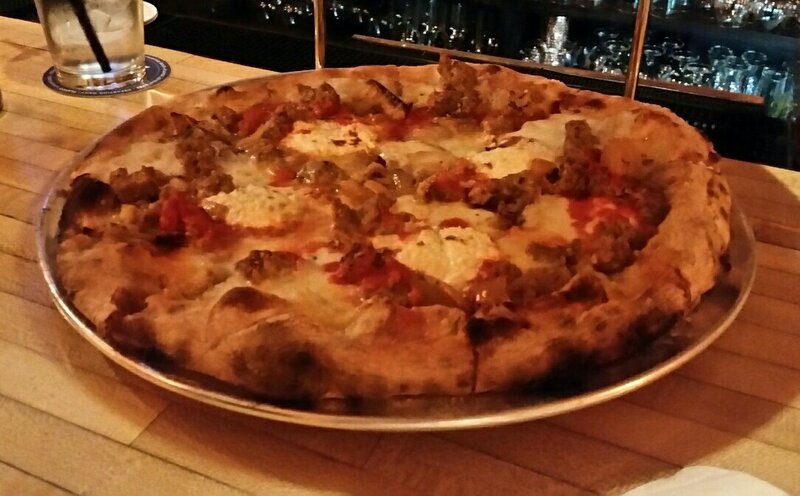 This entry was posted in Portland, ME food and tagged blog, food, peterpeterportlandeater, pppe on December 31, 2017 by peterpeterportlandeater. There are a handful of restaurants in Portland that I go to at least semi-regularly. Boda on Congress St. is one of those. They have a strong history of producing top quality food and drinks and in 2012 – only two years after opening – were nominated for a James Beard award. That nomination and their consistency keep them on the forefront of places I recommend going to eat in this area. We went back to the Thai restaurant early on a Saturday evening. The place was mostly full, but we were able to snag one of the last available tables. We sat and began to look at the menus. I was particularly interested in the specials because I was looking to possibly try something new and they always have a handful of seasonal food and drink items available. There were a fair number of classic and seasonal cocktails that looked interesting. I also noticed the house infusions including a tempting Dry-Hopped Maker’s Mark bourbon. In the end, I wasn’t feeling a drink, so that Maker’s would have to wait until my next visit. Mrs. Portlandeater did order a cocktail, the My Tie – Queequeg Spiced Rum, Luxardo Maraschino Liqueur, Dry Curacao, pineapple juice, lime juice, house grenadine, soda, mint and cherry. My wife’s drink came out, red and garnished with mint. She was pleased with it and we moved on to ordering food. 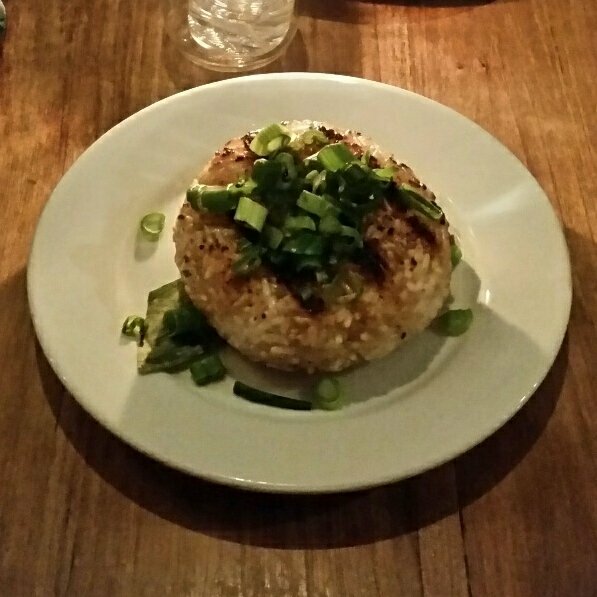 I was all in on the Thai Sticky Rice Ball with soy sauce, pepper, scallion, and garlic. 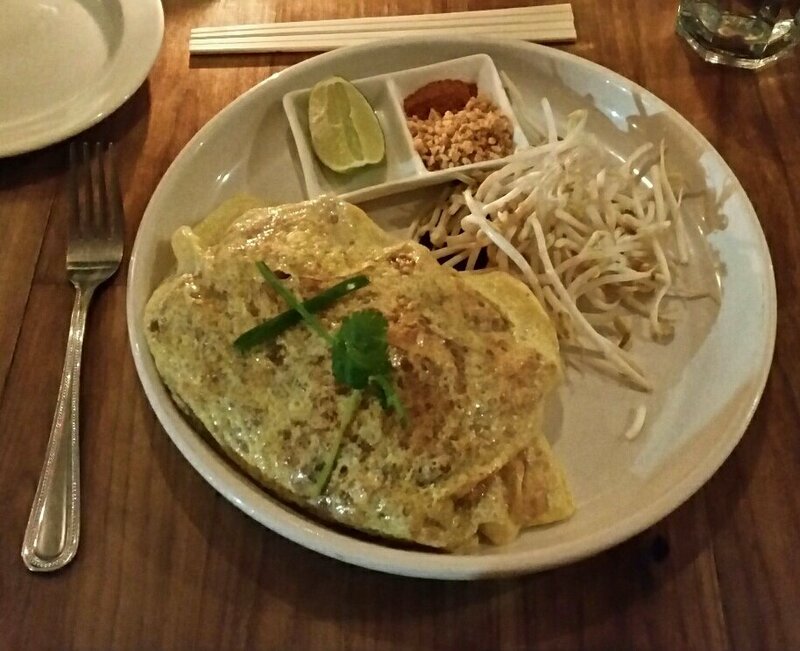 I also went with the Chicken Woon Sen Pad Thai – Stir-fried glass noodles with shallots, chopped tofu, salted daikon, bean sprouts, and Chinese chive wrapped in a thin Thai egg omelet and served with raw bean sprouts, lime, ground peanuts, and chili flakes. She considered a few different items from the grill, salad, and entree sections of the menu. 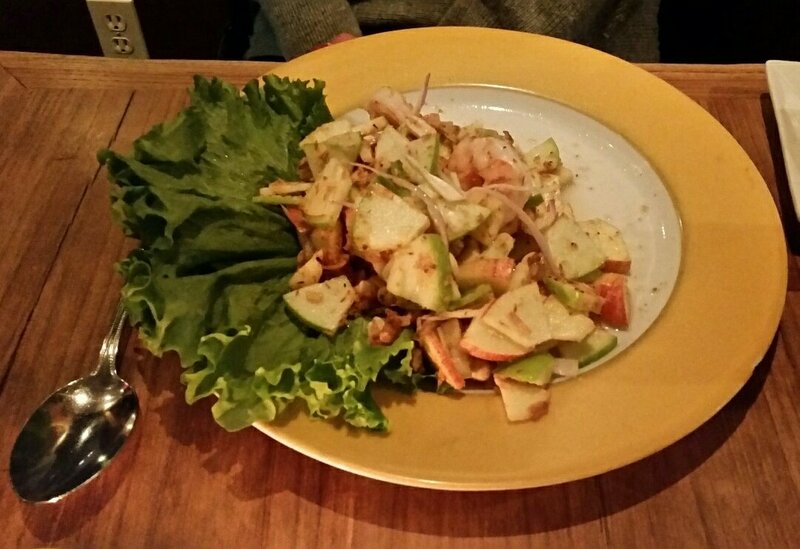 The final order ended up as Chicken Breast Skewers – grilled with seasoning soy sauce, served with sweet chili sauce – and an Apple Salad – apples, shrimp, roasted coconut, and roasted peanuts in a sweet sour dressing. 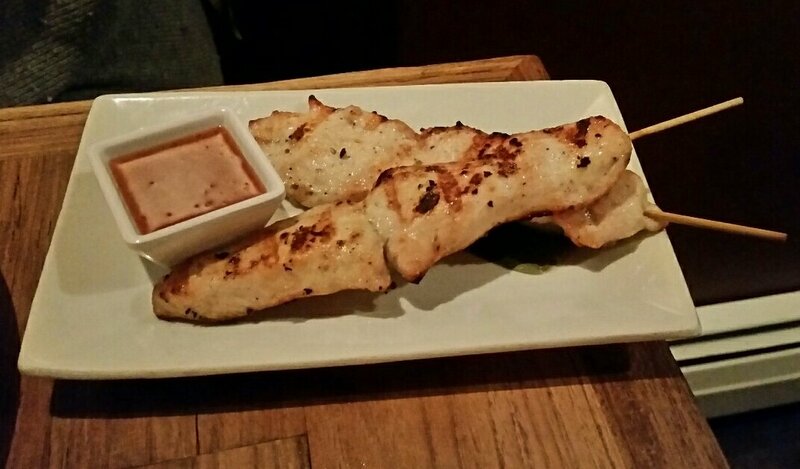 Boda’s skewers are always truly delicious. I might have been a bit jealous. The rice ball came out before all else. The grilled mass of pale carbohydrate was covered in scallions. My initial bite brought me back to my first ever visit there when it was the very first food I ordered. It hadn’t changed a bit. Soy, garlic, and pepper, with just a slight char from the grill transformed the rice into an otherworldly concoction like turning a tricycle into a rocket-fueled Harley. Shortly after we devoured the rice, the rest of the food came out. My wife’s salad and skewer were as I remembered them. I vaguely remembered mine food from when my wife had ordered it previously. I’d seen it and had a few bites, but I’d never ordered it for myself. The idea that the meal was legitimately an omelet fascinated me, so I was more than ready to have a go at it. I had one bite and it was great, but noticed the sides and thought the lime, peanuts, and chilis might add something to it, so I sprinkled them on top of my all-encompassing egg capsule. My next bite was a thrill-ride through a Thai theme park of taste. Of course the sweet pad thai noodle and veggie mix was delicious with its sauce, but the additional crunch, citrus, and spice took it to new heights. It was flavor on top of flavor and it was outstanding. With only a single item as my main course – the omelet – I wondered if it would be enough food for me. It turns out the omelet had some heft to it. It was alot bigger than it appeared on the plate. When I was about three quarters finished, I was getting quite full, but powered all the way through it, unable to turn away from something with such a brilliant flavor palette. When all was said and done, we had empty plates and full bellies. We passed up dessert and checked out. Our total came to about $43 plus tax and tip. Our meal was great as always. It’s no surprise that Boda – consistently positively reviewed and endlessly popular in Portland – continues to plug away with stellar food and beverage. They know well what they’re doing. Boda creates Thai food that transcends typical takeout and makes the customer feel like they’re dining finely, but in a very casual, relaxed atmosphere at a moderate price. It’s one of the first places I bring guests when I have someone visiting. If you haven’t been there, you should probably go. If you have, I assure you, it’s worth returning and even bringing other people along with you to enjoy the experience. They haven’t changed a bit and that’s exactly what keeps me going back. This entry was posted in Portland, ME food and tagged blog, food, peterpeterportlandeater, pppe on December 27, 2017 by peterpeterportlandeater. In June, I had the pleasure of going to Blyth and Burrows on Exchange St. just before it opened to the public a few days later. The hype of the bar blew through Portland last spring like a tornado. As details emerged, locals were intrigued by its well-thought-out historical theme and especially by its secret door leading to a different bar downstairs. I waited a while to head back to the popular locale, wanting to get through the initial excitement of its presence in the Old Port and giving it a little time to normalize. Still, I couldn’t forget about the insane amount of buzz it had generated over the summer. Because that ballyhoo was so crazy, there was a part of me that actually expected to be disappointed when I returned. It was too much to live up to, I figured. One concern I’d had – that it would be overcrowded and impossible to navigate – was put to rest immediately. Yes, it was busy, but not to the point of overcrowding. We took seats at the bar on the upper level and were promptly given menus and some water. The menus were mostly new from when they had opened, so I took careful inventory of what was now available, looking for a beer or cocktail to get the night started. After asking about the rotating taps and taking more time than we should have to choose a libation, we made our decisions. I went with Agave Navidad – sage infused tequila, Blackstrap Rum, mezcal, roasted pineapple, lime, orange citrate. 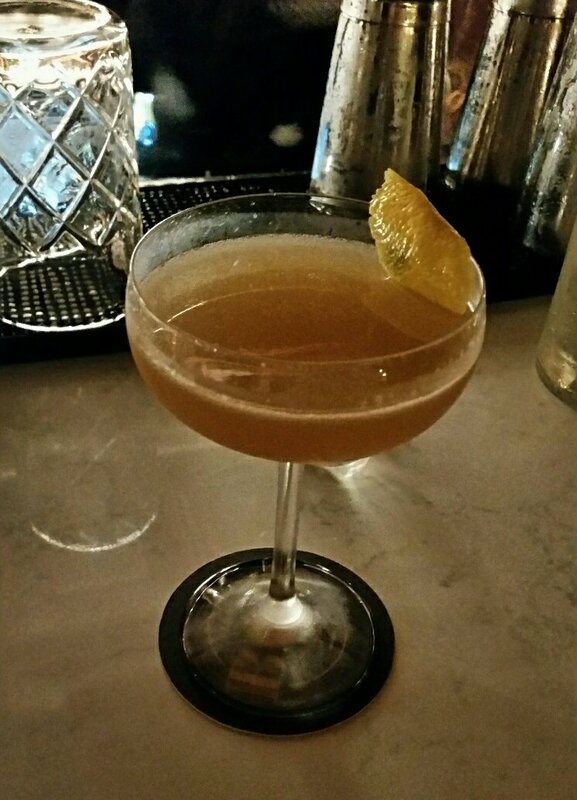 She decided to get Zuzu’s Petals – Stroudwater Vodka, Genepy, Cappelletti, cranberry, rosemary, lemon, bubbles. The food menu was small and focused on small plates, but there were several that caught my attention. I wasn’t interested in raw items, but that left both hot and cold dishes from which to pick. Before we could finalize our decisions, the bartender slid the drinks over. My cocktail was fruity with a permeating, but not overwhelming, mezcal smoke that I enjoyed. She found her drink’s flavors odd and quite tart. I agreed, but mostly liked it. We sipped away and made our final choices on food. 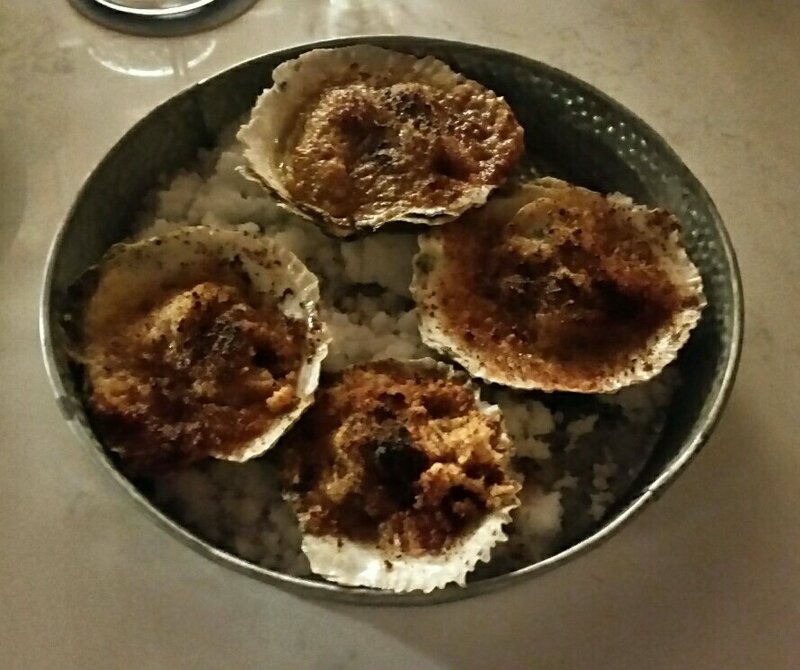 I ordered the Charbroiled Oysters – Old Bay, breadcrumbs, butter – and Korean Short Rib Bao – napa cabbage, jalapeno, kimchi. 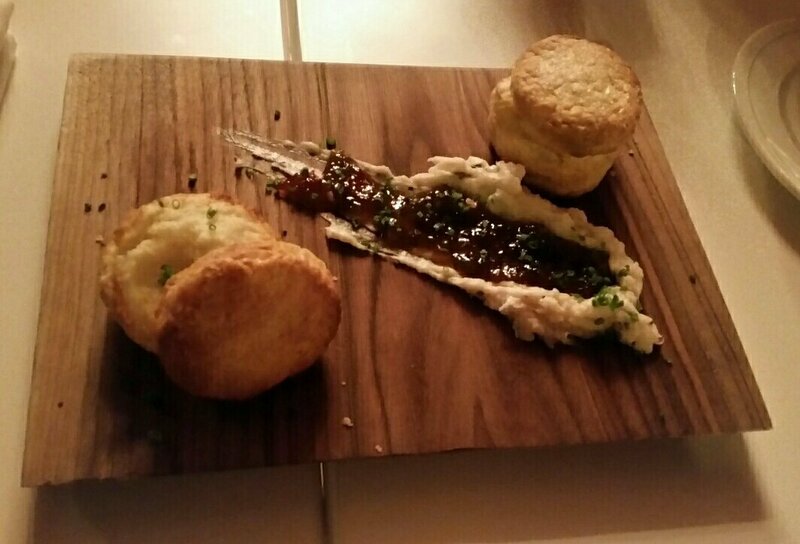 She went for Poke Bao – green onion, sriracha, jalapeno, tuna, sesame seed – and Goat Cheese and Honey – herbed chevre, maple pecans, local wildflower honey, crostini. Before the plates we ordered came out, we each received a complementary bite from the chef and shortly thereafter, both of our Bao orders made their appearance. 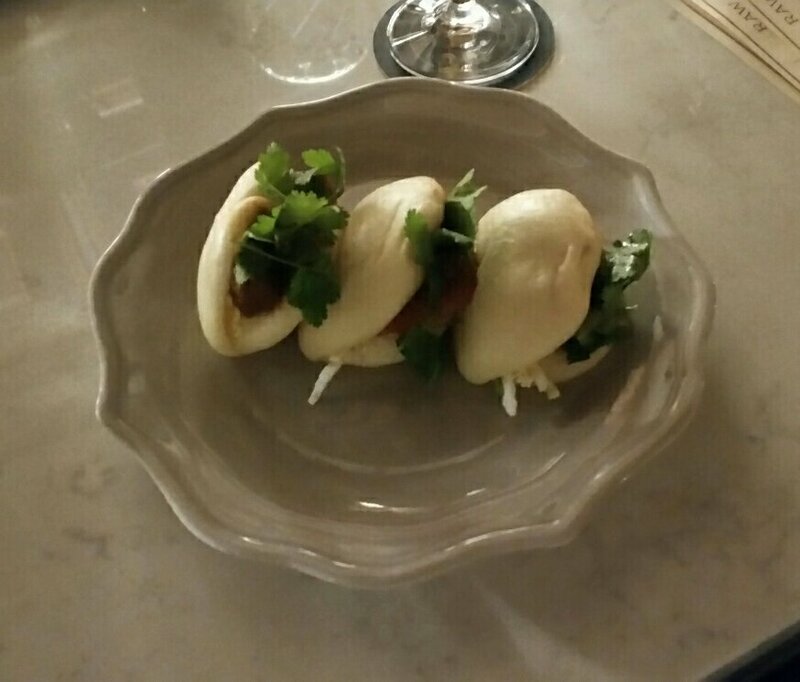 We each had three soft, doughy buns that looked like perfectly shaped tacos made of clouds. Hers was darker, mine light. I took a bite and loved it. There was a moderate spice, though nothing painful. A light sweetness rounded out the delicate, tender meat. It was a great start. As I took my second bite, Mrs. Portlandeater nearly fell off her seat. She repeated the the words “oh my god, this is so good” about five times while eating her first bao. She was mesmerized by the spicy tuna in the bun, eating it while also showering it with praise. She followed up her initial thoughts by letting me know she would need to eat them again in a few weeks, and added that it might have been the best thing she’d eaten all year. Once the buns were nearly done, the rest of our order came out. I went for the goat cheese, smearing it on one of the crostini. It was a little thin for spreading and broke in two as I attempted it, but I persevered, creating a duo of smaller open-faced sandwiches out of it. Crunchy, sweet, and cheesy, it was an excellent snack with lots of flavor which was only aided by the addition of pomegranate seeds and a little roe. With cheese done, I dug for an oyster. I had been offered a off-menu version, but took the more traditional ones. 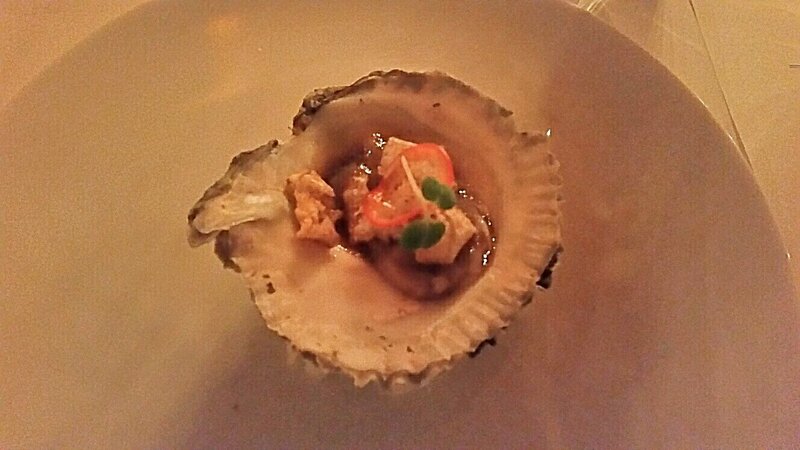 Upon consuming the first shucked shellfish, I was happy with the choice. They were mildly seasoned, but as is often the case with seafood, I enjoyed savoring its natural flavor. 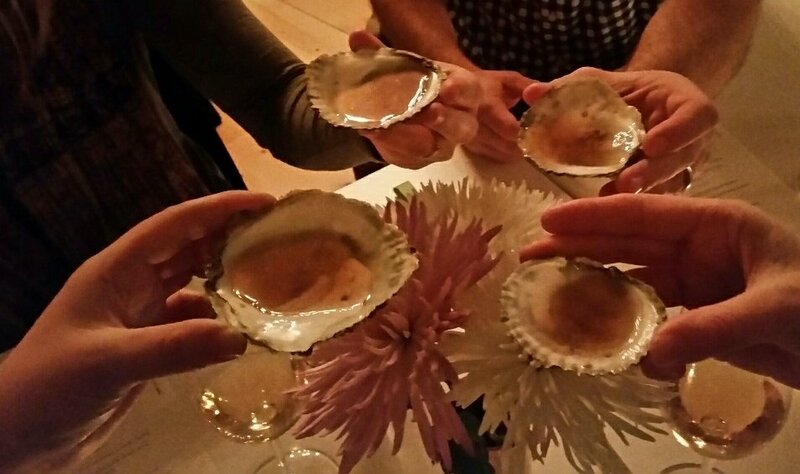 I consumed all four of my bivalves, relishing the straightforward manner of preparation immensely. My oysters were eventually gone, but I was still a little hungry. She decided to order a Prosecco, so I went back to the food. 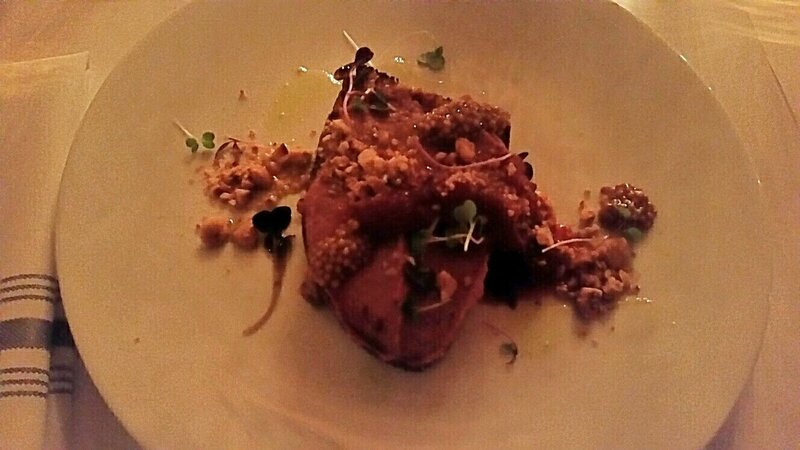 I quickly picked out the Mushroom Pate – North Spore Mushrooms, seasonal pickles, crostini. 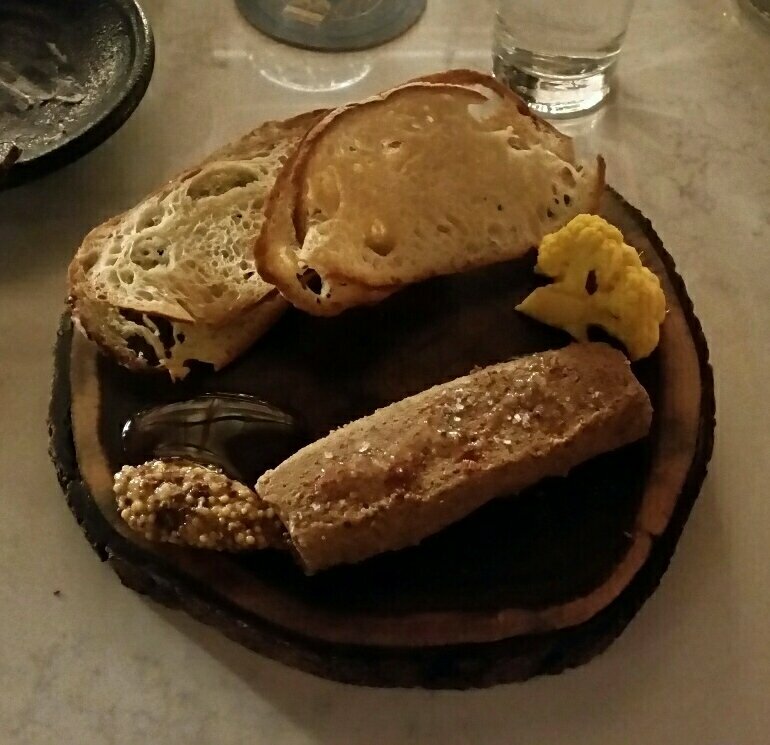 It didn’t take long before it came out with a large log of the pate itself, honey, housemade mustard, and a pickled cauliflower. Not wanting to break my bread again, I was careful about putting a pat of pate on it. I took a bite and felt it was tasty, but relatively weak. Wanting to jazz it up a bit, I threw on some mustard. The second bite was amazing, assisted by one of the best mustards I’d had in recent memory. A little honey made it even better as the mushroom honey mustard spread created a combination of flavors that made my mouth happy. Our food and drinks were eventually finished and we were ready to call it quits. Our bill came to about $91 before tip. All of our items were between $7 and $14. 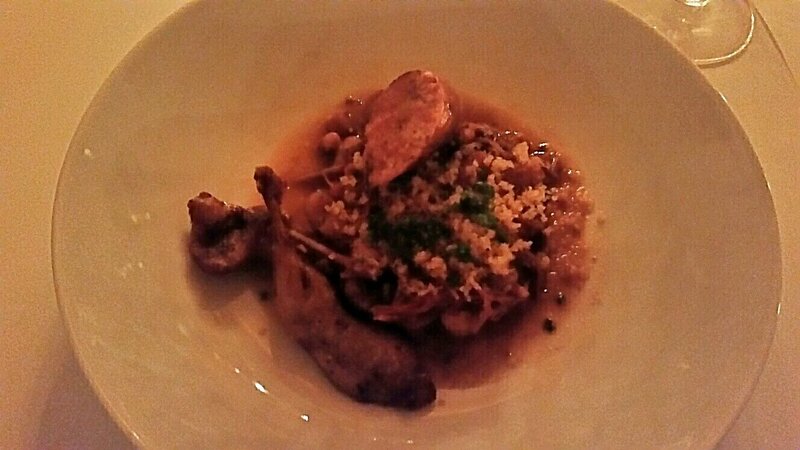 That was also the range of food prices on the menu as a whole aside from oysters at $15 per half dozen. We paid and made our way out, drifting into the cold, Maine night. Blyth and Burrows turned my expectations upside down. I expected little and got everything. 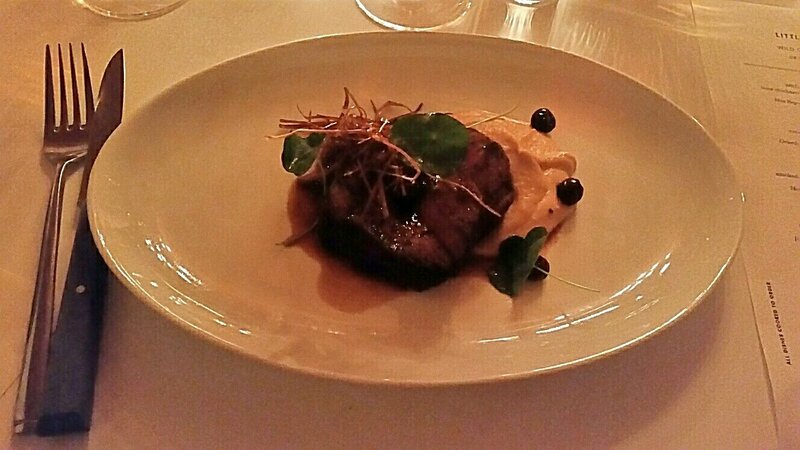 The drinks were solid, the food even better and the atmosphere as good as any around. The establishment is comfortable, looks really sharp, and feels like a place one could happily hang out in for hours. My two hopes are that next time I go I’ll spend some time in The Broken Dram downstairs and that at some point my wife will stop telling me how great her bao was. 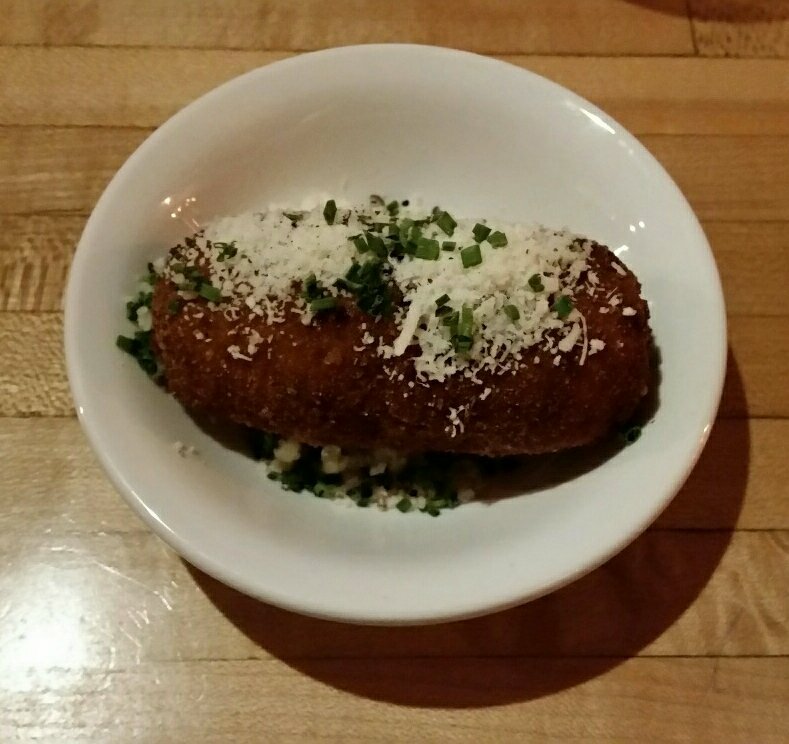 This entry was posted in Portland, ME food and tagged blog, food, peterpeterportlandeater, pppe on December 15, 2017 by peterpeterportlandeater. 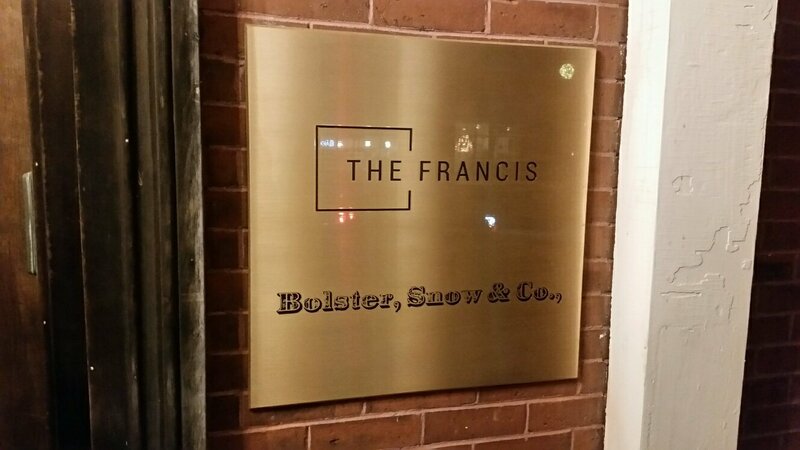 I was invited to Bolster, Snow & Co. at 747 Congress St. this week for a complimentary meal in return for an honest review. Having opened last month, it was on my list of places to go soon, and just a few weeks ago, we actually had reservations, but decided to stay in for the night instead. Needless to say, I was enthusiastic about my visit. The restaurant, with dinner 6 nights a week and brunch on weekends, sits in The Francis, a newer 15-room hotel in the Mellen E. Bolster House – recently restored and now officially a historic building. From the outside, it exudes a character produced by many structures in the area, with high-end beauty and limitless charisma. The interior continues the experience, as the renovation preserved the original detail, creating a warm atmosphere with lounge areas, bar, and main dining room. We were seated and began looking for a drink. Wines by the bottle or glass in addition to significant beer and cider options comprised the majority of the menu. However, the half dozen signature cocktails at the top demanded my attention. Amaretto, rum, gin, and vodka based libations were available and I chose the Honey Buck – Stroudwater Vodka, lemon juice, ginger syrup, honey ($12). Mrs. Portlandeater went with a glass of Sauvignon Blanc ($11). When ordering drinks, we were told by our waitress that they ask for the entire food order at once. We got to deciding our full meal from the modest selection which had choices of snacks, apps, and entrees. I spotted a number of starter types that looked good and suggested ordering three snacks ($6 each or 3 for $15). 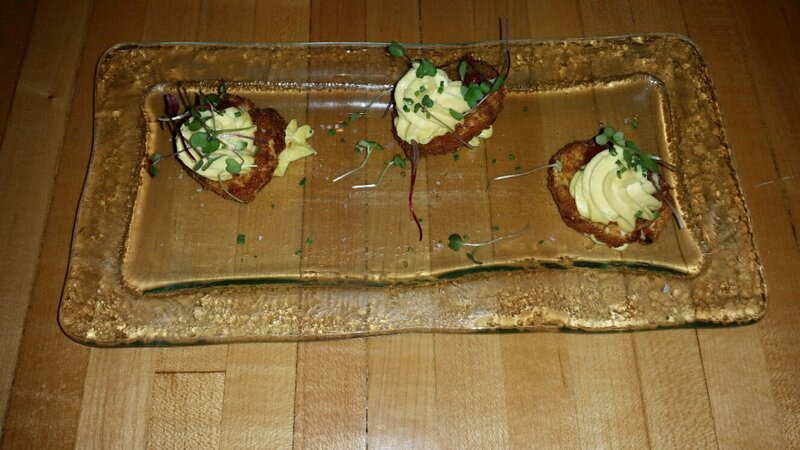 My wife agreed and we chose Parsnip Chips – herbs, togarashi, Deviled Eggs – truffle, and Fried Pickles – chipotle aioli. 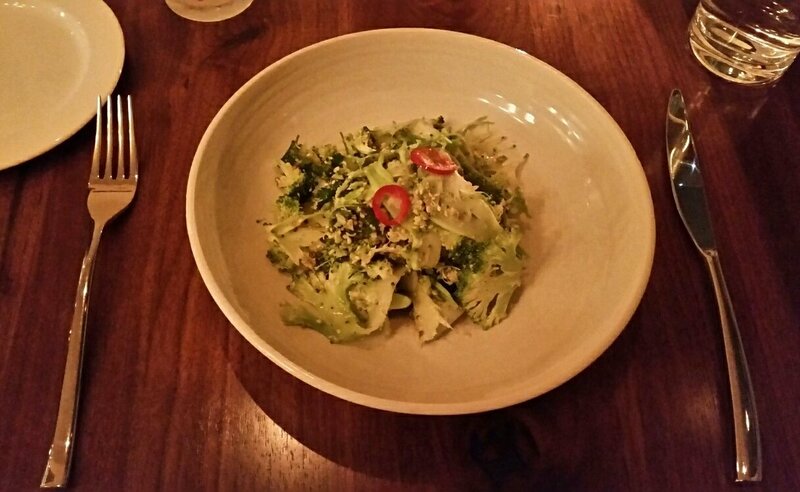 In addition to the snacks, I added an app to our starters, the Broccoli – almonds, herbs, lime, sesame seeds ($12). 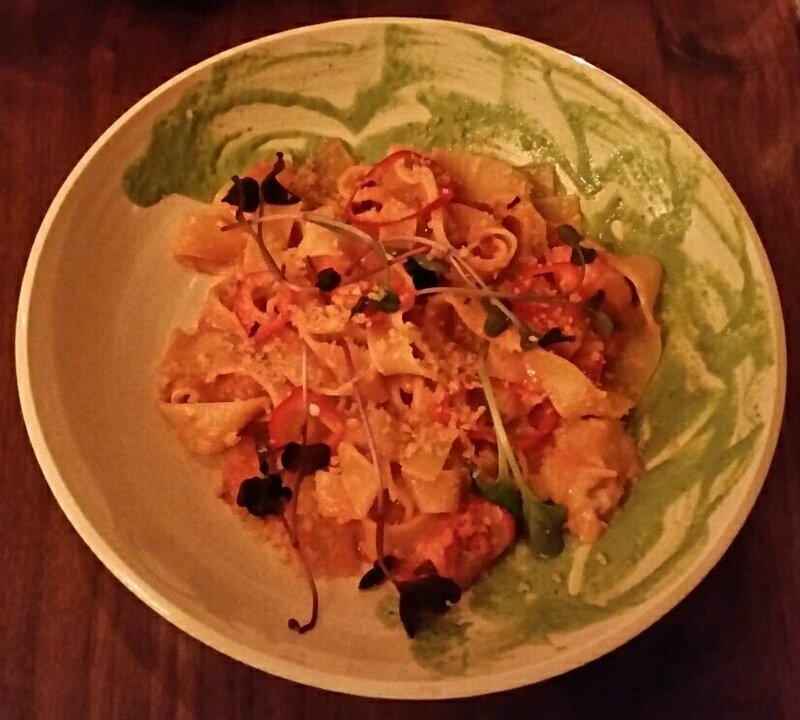 For our entrees, she went with Fettuccine – lobster, tomato, pickled finger chili, breadcrumb, basil ($33) – and I chose the Pappardelle – squash, radicchio, walnuts, bacon, sage ($23). I thought the order to be a good sampling of the available offerings. Our drinks came out and I tried a sip of mine. Its flavors left me reeling. The citrus was strong with perfect sweetness and just a touch of the ginger. It was truly delicious. I had my wife take a swig and she confirmed, expressing some regret that she had ordered wine instead. I had to make a conscious decision not to drink it all in one fell swoop. Bread and oil came out side-by-side with our broccoli. 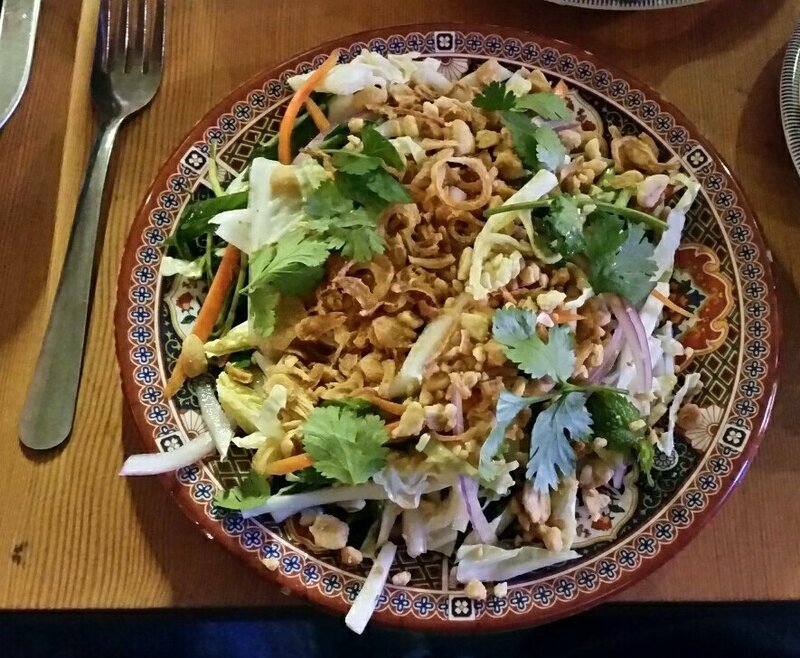 It was a salad along the lines of something you might expect at a Thai restaurant. Fresh and crunchy, the lime was most potent in every bite and I thought it to be brilliant. Citrus goes a long way in a salad and it created a powerful punch of flavor with the king of gorgeous green vegetables. The sesame added a follow-up of nutty goodness to it. Following the broc, we received the snacks. I started with the deviled eggs, consuming half of my first one. As a connoisseur of the evil eggs, I know a good one when I taste one and these were magnificent. They were relatively traditional, but the truffle took them to another level and there was no shortage of that awesome flavor. 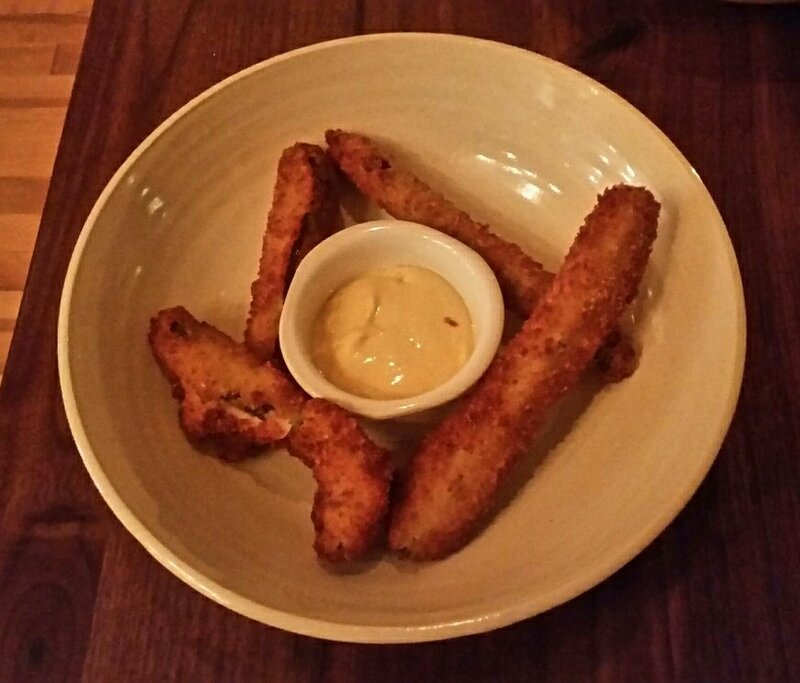 Fried pickles were provided as spears which I always find to be a brave play. Combined with the aioli, they were what I expected – quite tasty and a reminder of other similar local offerings that I enjoy. 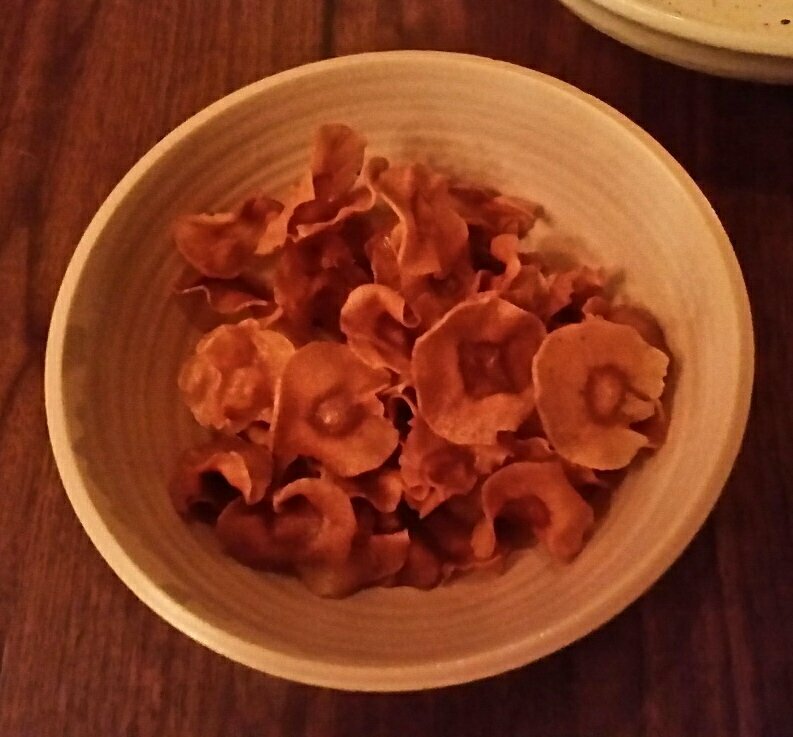 The parsnip chips were crispy and sweet. I didn’t get any of the togarashi or herbs, so I’m not sure if they were just too subtle or totally nonexistent, but the chips were still a suitable appetizer. Entrees came out and, though we were a little full, we were ready to try another course. 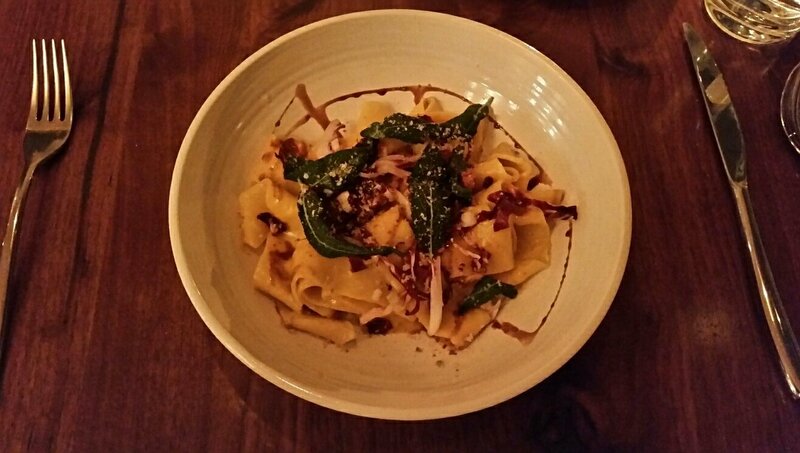 My pappardelle was creamy and dotted with the ingredients listed on the menu. There was a lot going on with many flavors coming together, different from the previous items we tried which were more focused on a killer ingredient or two. It had a little something for everyone – crunchy nuts and sweet squash were my favorite, but the bacon certainly didn’t hurt. She worked on her pasta, the sauce for which was tomato based. I preferred mine, but she liked the fett which was a bit spicy and had a fair allotment of the sea’s greatest crustacean. Toward the end of the meal, we gave each other a knowing glance. The pasta was solid and its taste made a really good meal, but I was also particularly impressed with ribbons themselves. They were ultra fresh, tender, and satisfying. All our food was done and we agreed to look at a dessert menu. There were three items and I was tempted by the cranberry eclair that we were “warned” was on the tart side, but I just didn’t think I could fit anymore in me. We passed up the opportunity for one last treat in favor of asking for the final tab. Our stay was coming to an end, but the thought of that eclair was left lingering in my brain. 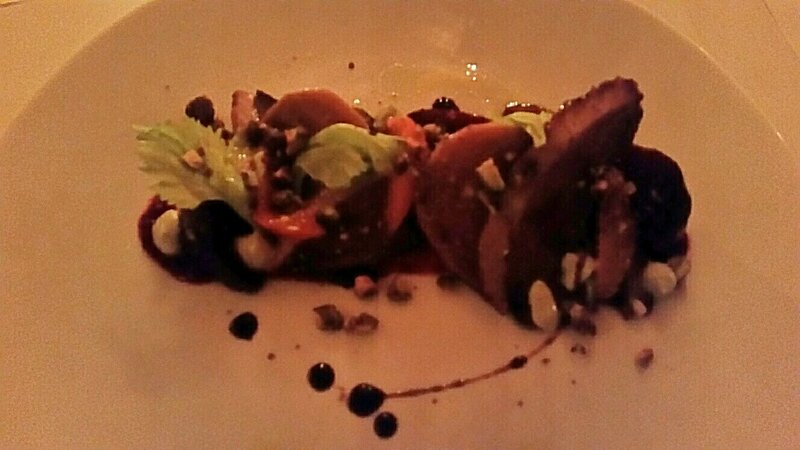 After my first full meal at Bolster Snow, I was impressed. They offer bold flavors, shining combinations, and take some simple contemporary items and add just a touch of their own hand in them. 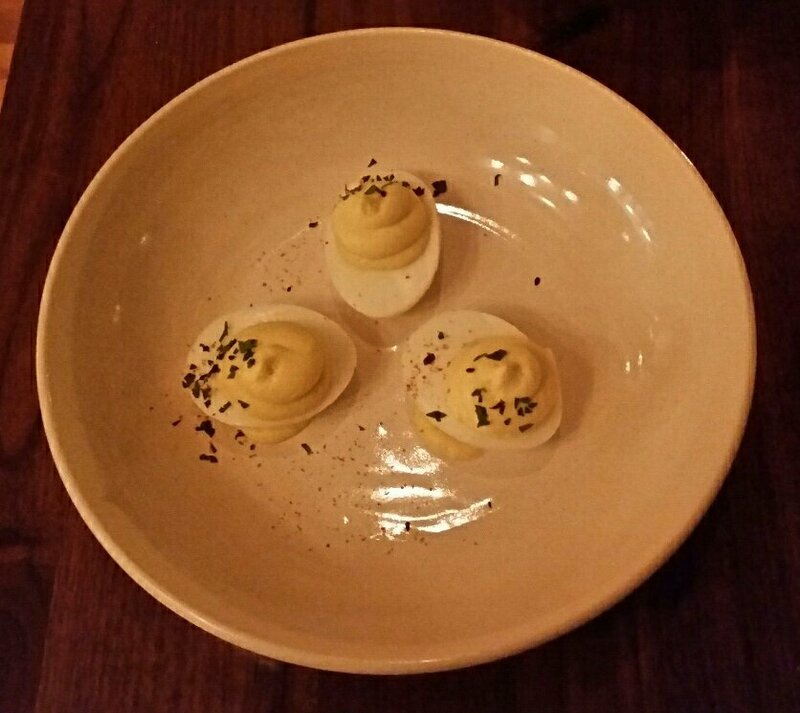 Basic deviled eggs with truffle? A total winner. Broccoli salad with a hit of lime? Stunning. A vodka lemon cocktail with hints of honey and ginger? An easy-going-down concoction. Try them for drinks and snacks if you want, but I think you just might end up staying for dinner. This entry was posted in Portland, ME food and tagged blog, food, peterpeterportlandeater, pppe on December 2, 2017 by peterpeterportlandeater.